International Priority is FAR superior in many ways, but expensive, I know. Ready to display, in excellent condition. Does not include original box or CoA if it had one. Therefore we have to offset this with handling to avoid loosing money. Just wait for your invoice. Sat: 10-4pm, Sun: 12-4. Tue - Fri: 10-6. 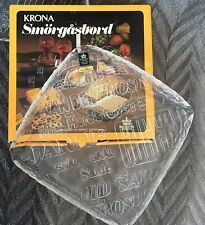 Lovely Royal Krona glass paperweight signed Mats Jonasson, with label, no chips or dings. Diam.9cm. Ht.1.8cm. Starting auction low, please checkout my other listings. Royal Krona full lead crystal glass paperweight with etched 'hedgehog' design, by Mats Jonasson, signed. Excellent condition, there is a tiny tiny rough spot on the bottom edge but it hard to see what it is, even using a magnifier. Approx 7" tall x 5" wide 2¾" deep. It has a sticker "Royal Krona Full Lead Krystal". The word cheese also appears in various languages, including English, French, and German. The side edges of the platter are turned up to make it easy to pick up and handle. Boxes are in fair condition. This vase has been used for floral display. It is smooth to the touch but does look a bit like a chip. The photos do not do this beautiful floral display vase justice. For your consideration… from Royal Krona in Sweden, a beautiful clear crystal pear, signed and numbered “RK 3051 FW”. From what I understand… the “RK” stands for Royal Krona art glass… a group of 5 art glass makers in Sweden, and the “FW” stands for Folke Walving an artist who created this and similar designs in the 1960s. "EDENFALK" SIGNED ROYAL KRONA CLEAR CRYSTAL VASE : (#4010). ONE - SIGNED AND NUMBERED ROYAL KRONA CLEAR CRYSTAL VASE. APPROX 7-1/2" TALL 3-1/4" WIDE, 3-3/4" WIDE CORNER TO CORNER. ESTATE FIND, NO RESERVE. Approx 7" tall x 6 3/4" wide at the widest point 2¾" deep. Signed byMats Johansson and numbered on the base bottom and it has a sticker as well. Royal Krona Full Lead Crystal Owl. Original label and signed on the bottom. However, they make a lovely coordinating (but not entirely matching) pair. The square one is 5-3/4" tall, 5" wide, and 2" deep. Glass paperweight an absolute great condition. Royal Krona Sweden Lead Crystal Owl Mid Century Modern Signed H. Dreutler 4 1/2”. Shipped with USPS Priority Mail. She's elegant and modernist, but still charming and her soft curves are attractive and touchable. Markings / Maker: Sticker reads as above, MALERAS etched into the crystal. Mats Jonasson. Royal Krona. Adam & Eve Art Glass Crystal sculpture. Adam is approx. 4 1/8" Tall x 2 3/4" Wide. Eve is approx. 4" Tall X 2 5/8" Wide. Circa mid 70's. For your consideration is a lovely glass owl from Royal Krona, Sweden. Sticker and marking on bottom. In excellent condition.